I have yet to meet someone who doesn’t like at least the idea of baking their own breads at home. Some of us are more accomplished bakers than others; some are avowed bread-machine users, while others (like myself) are hard-core sourdough bakers, and still others are sturdy, reliable users of commercial yeast to turn out their weekly loaves. Even among the non-bakers I know, the romantic allure of a home-baked loaf cooling on the counter is a wistful fantasy. They may be wise enough to know their own limitations, but that doesn’t mean they’re impervious to the almost mystical appeal of fresh bread. Still, most of us have also lived lifetimes filled with supermarket breads that have conditioned us to want — and even expect — soft, squishy sandwich loaves that we can use to make a lunchbox PBJ or a weekend grilled cheese. One of the most consistent pleas I get from readers is “Do you have a soft sandwich bread recipe?” Over the years, I’ve made various different breads that could possibly fit the bill, but none that ever became THE ONE. And once I transitioned to using sourdough rather than commercial yeasts for my bread-baking, I confess that a sandwich-worthy bread faded from my view. It was harder to figure out, so I resigned myself for quite some time to using my sourdough starter for chewier, soup-worthy loaves, pitas and pizza crusts. 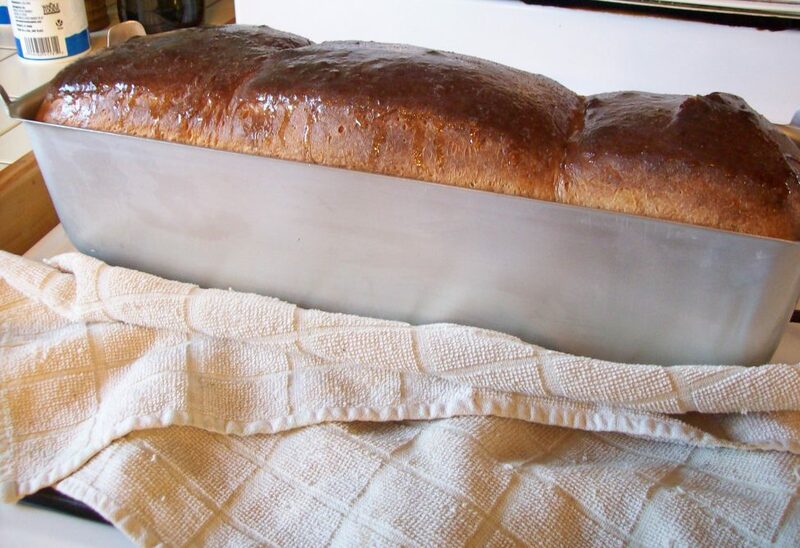 Yet it nagged at me, this idea of a loaf that I could bake up for all-purpose use. Especially as the kids have gotten older, and I’ve suddenly found that the one loaf of supermarket whole wheat I purchase each week to satisfy general family needs for toast and sandwiches no longer seems to stretch past Monday or Tuesday…leaving 3 more days until grocery day, and not a slice to spare. I abhor the mid-week grocery run to restock items we’ve run out of and won’t do it if I can help it (ditto to spending an additional 3 or 4 bucks on a second loaf of bread), but with flour always in the pantry and a jar of sourdough starter ever-present in the refrigerator, the idea of baking a loaf to get us over the hump — or better yet, baking a LARGE loaf on the weekend that would eliminate the need for supermarket bread altogether — had a certain appeal. Finally, I indulged in the purchase of an inexpensive long loaf pan and started tinkering. The first few loaves were close, but not quite right, and the uneaten chunks were sacrificed for bread crumbs and croutons. But then came the loaf that changed everything. It came out of the oven just a couple of hours before dinner one night, so we sliced into it to test it out alongside our roast chicken and vegetables. It was…soft. Not super-squishy like the most overly processed grocery store breads, but lovely and springy and (dare I use this word?) moist. We devoured it. I wrapped the rest of the loaf well, along with a stack of slices I’d already cut but hadn’t served. The next day, I apprehensively checked the pre-cut slices. They were still…soft. No hint of drying out. I decided to go all in, and made myself a ham and cheese sandwich. It was at least as good as any sandwich I would have made with our usual supermarket loaf, I thought, but I was still afraid to trust my own senses — I’m a lot less picky about these things than J. and the boys. So I waited for J. to come home from an appointment, and offered him a sandwich. Some girls need diamonds or dinners out…I need bread-baking validation. Thumbs-up from all three of my guys. So I present to you now, my latest and greatest achievement: The elusive holy grail of breads. Tinker with it in your own kitchen and see what you think. 1) Homemade bread is usually much heavier than even the most “earthy crunchy” whole grain supermarket breads, so two slices of it for a sandwich is just plain too much bread for one serving. If nothing else, I’d love to know how commercial bakeries physically lighten their loaves and make a smaller more uniform crumb. Of course, the ability to slice it uniformly goes a long way towards this, too. 2) Shelf life. I hate a sandwich made with “stiff” bread that’s even as young as 1-2 days old. You can slow-down the degradation by refrigerating it or you can freeze it, but then it basically has to be a toasted sandwich unless you’re willing to wait for a defrost or risk rubberizing it in the microwave. While you can make a softer bread and finer crumb with egg and/or milk, I don’t think you can do much about shelf life without dough enhancers or preservatives. Anyway, great post! If I get a sourdough starter going, I’ll definitely give this a try. I totally feel you on both of these points! The good news is that this particular bread does have a lighter texture and more uniform crumb — it looks very similar, sliced, to supermarket whole wheat. We’ve gotten good over the years at slicing and I tend to slice just a HAIR thinner than grocery breads, not so thin that it won’t hold up for sandwiches, but slightly thinner to offset any heaviness. As to shelf life, we find that sourdough tends to survive somewhat better than commercial-yeast breads. It has something to do with the fermentation process, I’ve heard. No, it doesn’t last a week or more with no degradation at all the way grocery store bread would, but we’ll be able to get several days’ worth of sandwich and general bread-and-butter use out of these loaves, and if we properly wrap the rest (and maybe help it out with a few days’ storage in the refrigerator) we’ll be able to use up the loaf on toast by the end of the week!